Circa 1973 Topps Wacky Packages Stickers Original Rough Color Art! 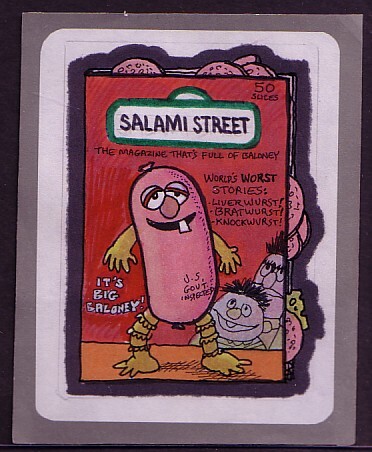 Salami Street. Direct from the legendary Topps Vault, this auction features the original hand drawn color pen and ink rough art created early in the Series 3 Wacky Packages production process. One-of-a-kind, this unpublished piece measures approx. (3 1/2" X 4 1/4") and is in its original state. This wonderful parody drawing was recently discovered among several other Series 3 roughs. A real keeper! All Topps Vault auction lots come with a certificate of authenticity. Please visit our other sports and pop culture ebay auctions for other exciting memorabilia from the Topps Vault. Value of Package: Over $499 Shipping Charge $12. All orders over $100 must be insured. The UPS charge is 35 cents per $100 of insurance coverage purchased after the first $100. The first $100 of value is insured at no charge. For residents of AK and HI, additional shipping charges will apply. Canadian and other International customers will be responsible for shipping and all applicable duties and taxes. All Canadian orders are shipped vis UPS. Please note that UPS will charge a brokerage fee in addition to standard UPS charges.. This seller, thetoppsvault, prefers PayPal.